I've been really getting into the whole "clean eating" lifestyle lately, but I'm still getting over my urges for certain dishes. Like Thai food, for instance. I love those spicy noodles, but haven't attempted to whip them up myself. I found a recipe on Eat Clean Diet that will satisfy my craving and leave me feeling guilt free. 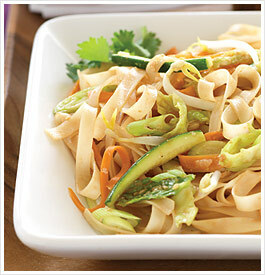 Cover the rice noodles with boiling water in a ceramic bowl. Cover and let stand for 20 minutes to soften noodles. Drain, reserving 2 Tbsp / 30 ml noodle water. In a small bowl, whisk together all sauce ingredients. Set aside. In a large skillet, heat oil over medium heat. Stir in garlic, cabbage and carrot. Stir-fry for 5 minutes. Make a well in the middle of the pan and scramble the egg whites. Add noodles and sauce and cook for 5 minutes. Add bean sprouts, zucchini and green onions and cook a little longer to heat through. Remove from heat and serve. Garnish each dish with chopped cilantro.